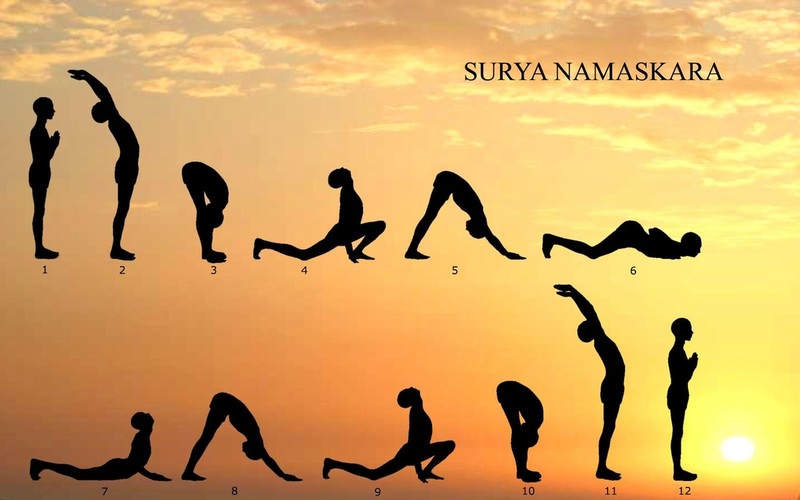 Surya Namaskara means "salute to the sun"
This is a common sequence of asanas. Its origin lie in a worship of Surya, the Hindu solar deity. This sequence of movements and asanas can be practised on varying levels of awareness, ranging from that of physical exercise in various styles, to a complete sadhana which incorporates asana, pranayama, mantra and chakra meditation. In some traditions, 12 Surya Namaskaras are performed at one practice. If starting that practice for the first time, it is generally started with fewer (3 to 6) Namaskaras per day, and then gradually increased to 12 Namaskaras per session by the time a week is over. Mantras are pronounced at the start of each Surya namaskara. There are a total of 8 different asanas in the sequence of the 12 asana changes of Surya namaskara. Some asanas are repeated twice in the same cycle of a Surya Namaskara. In a traditional Hindu context, Surya Namaskara is always performed facing in the direction of the rising (east) or setting (west) sun. 12 names of Sun are chanted in each mantra. STEP 1: Stand on your yoga mats specifically facing to the Sun. Then start with the Yoga Mountain Pose. Bring your palms together in Namaskara position in front of your chest. Exhale. STEP 2: As you inhale, raise your arms overhead, keeping your palms together take them backwards. STEP 3: Exhale and then bend forward until your hands touch your feet. If possible try to touch the ground and tuck in your head to touch the knees. STEP 4: As you inhale, step the right leg back, arch back. Let the left foot be in between your both hands and lift your chin and hold your breath. STEP 5: Exhaling, step the left leg back into plank position with neck & head between the two hands. Keep your spine and legs in a straight line and support your weight on hands and feet. STEP 7: Inhaling, stretch forward and bend back and look at the sky. Keep your arms and legs straight. STEP 9: As you inhale, bring your left leg forward, with the top of the foot stretched out flat on the floor, and lift your chin. STEP 11: Inhaling, stretch your arms forward and over your head. Slowly bend backward from the waist. Just like we did in step 2. Those who salutes the sun every day, (their) life expectancy, conscious, strength, courage and vital power would grow. Surya namsakara is a great exercise for complete body workout. It gives exercise to whole body. Hence joints become strong show increased flexibility. It regulates blood circulation and also improves digestion.